Since November 2004, Tray Display Advertising has been a great success at selling advertising on fast food tray liners and pizza box toppers in Wendy’s and Little Caesars Pizza and now they want to share their secrets and advice with entrepreneurs around the globe. Denver, CO, March 17, 2007 –(PR.COM)– This is a true and inspiring story of a 22 Year old Entrepreneur that transformed a regular "8 ½ x 11" piece of paper into a full time advertising business. Phillip Tapia is the founder and president of Tray Display Advertising, Inc… Oct 2004, Phillip developed a new advertising concept that would not only serve as an economical value by turning trash into cash, but it would also save restaurant owners thousands of dollars a year. For the past three years, Tapia has sold ad space on tray liners and pizza box toppers in two of America’s favorite fast food restaurants, Wendy’s Old Fashioned Hamburgers and Little Caesars Pizza. The advertising industry spends billions of dollars every year in attempt to influence the average consumer to purchase their product or service. According to the NRA’s 2007 Restaurant Industry Forecast, Quick service restaurants are projected to register sales of $150.1 billion in 2007. According to Blumenfeld and Associates, Inc., Approximately 3 Billion pizzas are sold in the U.S. each year, and According to Bolla Wines, 66.66% of Americans order pizza for a casual evening with friends. Equipped with passion and enthusiasm, the young entrepreneur was determined to get his piece of the pie! Phillip and his father (Mike Tapia) currently distribute to 26 Wendy’s restaurants in southern Colorado along with dozens of Little Caesars Pizza locations in Colorado Springs, Pueblo, and Denver Colorado. Between Wendy’s and Little Caesars pizza, the Tapia family will print and produce more than 400,000 tray liners and pizza box toppers every month. Tray Display only uses soy-based inks and prints on 100% recycled paper to ensure our tray liners and box toppers are environmentally friendly. "The best part of Tray Display Advertising is its simplicity, when you realize that a regular piece of paper is the cause for helping so many people, it can really open your eyes to the opportunities that surround us every day," Phillip said. Tapia built relationships with national marketing directors and brand name companies such as Crayola, Ringling Bros. and Barnum & Bailey Circus, Bally Total Fitness, Pepsi Cola, Earl Schieb Auto Paint & Body Repair, Fast Fix Jewelry Repair, and Ace Cash Advance. No space on Tapia’s tray liner and pizza box Topper will go to waste, including the reverse side, when customers turn it over there is more. Tray Display Advertising features a monthly coloring contest with custom designed artwork of client’s mascots and local radio station DJ’s created by Kevin Cordtz, Tray Display’s coloring contest artist. "It’s a great feeling when presenting an award to a child and seeing their face light up after they just won the Tray Display Coloring Contest, I believe it is extremely important to support the youth of our community by encouraging children to use their creativity and imagination," said Phillip. The sponsoring radio station invites listeners to stop by their neighborhood Wendy’s or Little Caesars Pizza to pick up a tray liner or pizza box topper and color the contest to win great prizes. "When partnering with a radio station, not only will your company benefit, but your advertisers and your restaurant outlet will receive free advertising as well," Phillip said. Every month, hundreds of coloring contests are turned in to Wendy’s and Little Caesars Pizza for judging. Age groups 4-6, 7-9 and 10-12 are awarded with prizes from Crayola, Pepsi Cola, Wendy’s and Little Caesars Pizza, plus each winner can get their photo taken with Caesar Man. "I like the fact that not everyone throws their tray liner or pizza box topper away anymore," said Tapia. Word has began to spread about Phillip’s one of a kind business, earning him featured stories in several Colorado newspapers as well as a featured story in a National publication "Home Business Magazine." 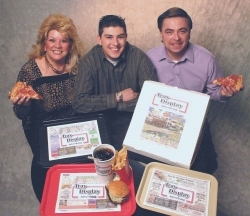 Tray Display Advertising has received hundreds of emails and phone calls from people around the world, all wanting to know how they could start their own tray liner or pizza box topper advertising business in their surrounding area. All the positive feedback motivated Phillip and the Tapia family to write a Tray Display Advertising "How to Manual." "Now anyone in any Country, any State, or any City can download our 8 step 56 page manual at www.TrayDisplayAdvertising.com," Phillip said. The manual will serve a case study of how a young entrepreneur took an "8 ½ x 11" piece of paper and turned it into successful advertising business. Phillip’s "How to Manual" is entitled "How to Make Fast Cash Out Of Fast Food Trash." "My goal is to teach people from all over the world on how to start up a successful tray liner and pizza box topper advertising business and sell it in some of the world’s favorite fast food establishments," said Phillip. To receive additional information and digital photos on Tray Display Advertising success story, Please fill free to contact us. This entry was posted on Sunday, June 3rd, 2007 at 12:41 pm	and is filed under Entrepreneurship. You can follow any responses to this entry through the RSS 2.0 feed.